Urban flooding is a complex and distinct kind of flooding, compounded by land use and high population density, and it requires a different approach to assess and manage, says Framing the Challenge of Urban Flooding in the United States, a new report from the National Academies of Sciences, Engineering, and Medicine. The report calls for multi-agency and cross-jurisdictional efforts to assess urban flood hazards, advance understanding of social impacts, and effectively communicate urban flood risk. Flooding is the natural hazard with the greatest economic and social impact on the population of the United States. It causes significant loss of life, incurs tens of billions of dollars in property damage, adversely affects millions of people, and delivers a heavy toll on the economic well-being of major metropolitan areas. Within cities, flooding results when the inflow of stormwater exceeds the capacity of a drainage system to infiltrate water into the soil or to carry it away. The costs and impacts of urban flooding are growing more severe as development and population growth continues in urban areas and as sea level rises and heavy precipitation events become more frequent due to climate change. NAS says that the committee selected four different metropolitan areas — Baltimore, Chicago, Houston, and Phoenix — to examine urban flooding in the U.S. The different combinations of physical environment, flood source, and extent of development resulted in distinct impacts. The report finds each city has a unique flood hazard and uses a tailored mix of resources to manage it. The Federal Emergency Management Agency (FEMA) and other federal, state, county, and city government agencies have roles in preparing for, responding to, and mitigating flood impacts. FEMA carries out methods to estimate the likelihood and extent of flooding from riverine, coastal, and other types of flooding, and the agency is well-positioned to take a leading role in establishing methods for analyzing urban flood hazard, the report says. New analyses and maps need to incorporate urban components, such as the capacity of stormwater systems, as well as the small topographic variations and local drainage and building patterns that drive the granular nature of urban flood impacts. The two methods for estimating the magnitude of urban flooding — a retrospective analysis of historical loss data and a prospective assessment of flood risk — provide a sense, but not an accurate monetary estimate of the magnitude of urban flooding, the report says. 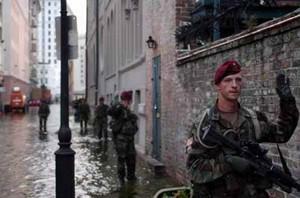 It is clear, however, that urban flooding is costly, particularly in coastal cities. Workshops held during the study established that people want to know and understand their flood risk; the report recommends a new generation of flood maps and visualizations to communicate flood risk in urban areas. Impacts vary across the social spectrum, with socially vulnerable populations at higher risk and less protected by insurance, the report says. A greater investment in research is needed to understand and develop interventions to mitigate the social impacts of urban flooding. Depending on the metropolitan area, more than a dozen organizations and agency departments may be involved in managing urban flooding. For major floods, FEMA coordinates mitigation, response, and short-term recovery operations. However, many urban floods are too small to invoke federal oversight, and those are managed at the state or local level. The report calls for stronger coordination across federal, state, and local agencies that manage urban floods to work together quickly and efficiently during a flood.